When you need hope, you’ll grab at anything to get it. It’s a vulnerable place to be. And it’s definitely not a fun place to be. And that’s true, but I would like to be a little more practical than that. I’d like to show you one way God is helping me find hope, so you can learn to find it, too. Hope is elusive because it seems to be closely tied to our circumstances, which can change from minute to minute. Our circumstances can easily dictate our emotions, which can easily “boss” around our hope, making it hard to find as our circumstances shift and change. So, our hope has to be grounded in something different than our circumstances. Our hope has to be grounded in the Word of God. The Bible can give us so much hope, if we will look there! But we don’t always remember to go there, so let’s go there now and remember what beautiful hope God can give us. Have you ever seen such HOPE? …God has called us to glory, and just like Jesus’ glory included suffering, so our glory will include suffering. …In God’s eyes, this life we live lasts just a little while, so let’s ask Him to help us see through His eyes that our suffering also lasts only a little while in the scope of all eternity. …Someday soon, God Himself will restore us. He will make us strong, firm, and steadfast. …We want that strength, firmness, and restoration now, but it is coming later. So now we need to lean in to the suffering, taking care of ourselves in our weakness and allowing our bodies the rest they need. …The last thing we want is to lean in to suffering! But if we do, we will learn valuable lessons God has for us. As we learn, He will be able to use us to help others going through the same things. …Our place of strength, firmness, and restoration IS coming, so we CAN have HOPE! This hope is tied to our faith in God’s perspective and God’s working in our lives, so we must live by faith in what He is doing. Oh, God, thank you for renewed perspective! Help us not to resist the suffering You have shared with us in your grace. Thank you that it is part of your glory–glory that we will experience in all it’s fullness someday soon! Help us to lean into our pain, letting you teach us and use us to help others. Help us to be gentle with ourselves. Help us to see with your eyes. Thank you, dear God, for all you’re doing in us. How do these truths give you hope in your circumstances? For more lessons in finding hope, a newly published resource is available! Discovering Hope by Cindee Snider Re is now being sold on amazon.com! For more information, go to http://www.chronic-joy.org. If you want to support the Chronic Joy Ministry, co-founded by Cindee and her friend Pamela Piquette, order through Smile.Amazon.com. Disclaimer: I do not receive any compensation for the above mentioned resources, and I hope that you will be blessed by them as I have. 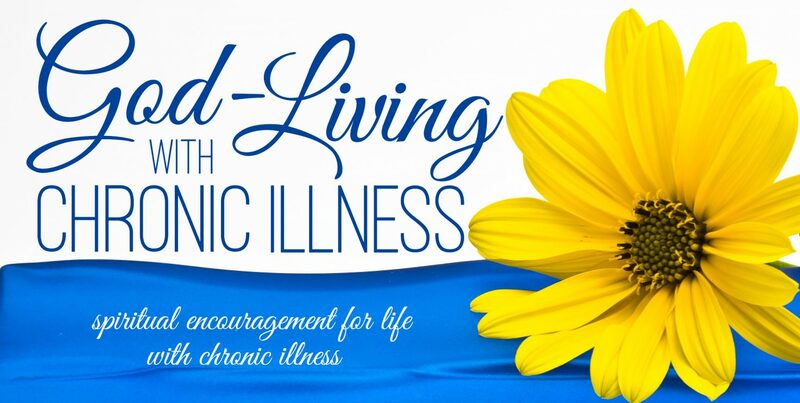 Disclaimer: The ideas posted on God-Living with Chronic Illness are not intended as medical advice and should not be taken as such in place of your physician’s recommendations. This entry was posted in Faith and tagged Chronic illness, chronic pain, God, Hope, perspective, suffering. Bookmark the permalink. I lived 13 years with HIV – and over 4 years ago, I gave it all to our God – and without any medications for 4.5 years, I am still alive and healthy – Our God can do anything He so desires – all for the greater good of His will. Be blessed and not deceived. Our God is good! So glad you are doing well! Thank you for all that you do to share the encouragement that God has brought to you! I was so blessed by Cindee’s book also. I want to hold onto the HOPE that Jesus brings to us. And thank you for the great playlist that you have here. My heart has been so blessed to stop by here tonight. –Blessings to you! I am so blessed by your kind words! I am there with you, holding on to hope! Thanks, Dionne, I’m glad it was a blessing.